This entry was posted on October 24, 2017 by Jessica Anderson. Looking for a fun event? Consider hosting a chili cook-off! Whether big or small, cook offs are fun to participate in, whether as a contestant, a judge, or an eater. With all of the popularity of cooking competitions, why not put your skills to the test and enter your favorite chili recipe! When hosting a cookoff at your home, church or office, check out my past post ‘Top 8 tips for a Chili Cook-Off”. Tips include using crock pots for serving, taster cups for trying each chili entry and judging strategies. Today’s blog is about the fun stuff, Awards and Prizes, our specialty. Add hype to your competition with hardware for your judges, participants, AND winners! Many hosts give each participant a momento of the event. Popular inexpensive gifts include Participation Ribbons, Chili Cookoff Medal, and our best-selling lapel pins, Chili Pot or Chili Pepper. Acknowledge your judges with a ribbon. We offer two different styles of judge ribbons, the Chili Judge Rosette Pin or the Chili Cook Off Judge ribbon. When pinned on the judge, it gives them the authority to make the ultimate decision on the cook off winner! Trophies2Go offers a huge range of trophies and awards for your winners, from a one-time award, to a trophy that can be passed around from year to year. For a more traditional award, it doesn’t get any better than a blue ribbon. The popular Chili Cookoff Ribbon comes in Blue for 1st place, Red for 2nd place, White for 3rd place, and Purple for any special awards categories you may have. We offer a wide range of chili trophy styles in all price ranges. 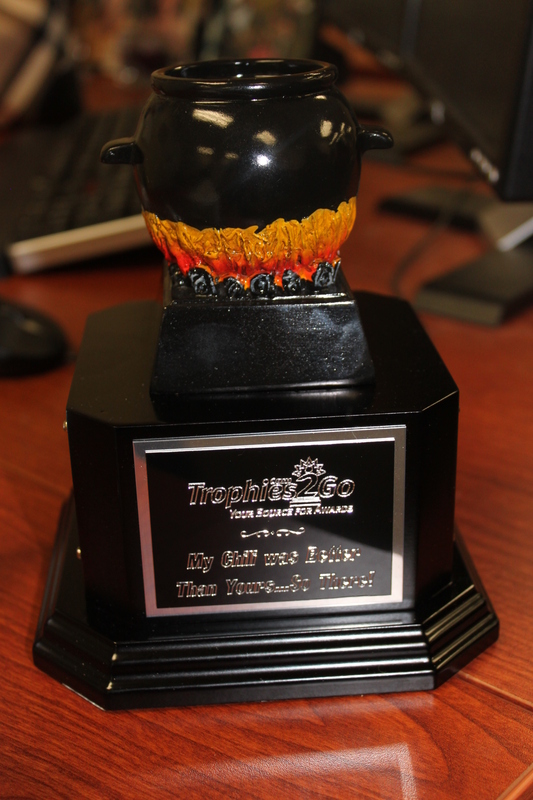 - One time trophies: Our new Red Chili Pepper Trophy is a bright and fun trophy; it's gotten great feedback from customers. 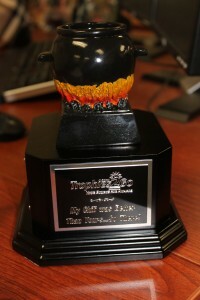 Our Flaming Hot Chili Pot Trophy is over the top, 80's style, but is sure to be talked about! Resin chili trophies are extremely popular with my favorite being the Hefty Black Cauldron Trophy. - Perpetual (Ongoing) Trophies: If you have an annual cookoff like we do, you may want to award a perpetual trophy for your cookoff. This is great for bragging rights, as the winner's name can be engraved on the side and the trophy is passed around from year to year. - Unusual awards: Consider our new Chili Cookoff Championship Award Belt. This impressive belt with make a huge impact on your participants and winner! If trophies, ribbons and medals aren’t really your style, maybe you’d like a more functional gift for your winners. Great items include our engraved cutting boards, engraved ladles, chili pepper aprons. One cute hostess gift idea is a hot sauce and engraved wooden spoon inside. We offer many personalized kitchen accessories that will impress your winner or hostess. We love chili cookoffs, as they are the perfect fall and winter activity to connect with friends and family. I hope your cook off is a huge success!